by David Edge and John Miles Paddock! 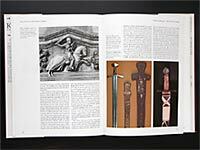 We've secured a fine copy of the book by David Edge and John Miles Paddock, Arms & Armor of the Medieval Knight. This excellent book is hard to find, being long since out-of-print. As such, it's commanding prices upwards to $200 US. Rumor has it that David Edge, himself, is even seeking copies for his own use! 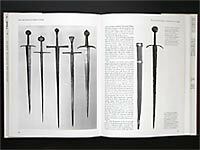 This rare book can only be found used and is often listed for prices ranging between $75-$200 US. This contest is only available to subscribers of our Exclusive Offers and Promotions usergroup. 100% of your subscription proceeds will go right back into buying other contest prizes just as we did with this one. You must be joined prior to Monday, March 15th, 2004. All participants will be entered into a drawing and the winning name will be randomly selected later that same Monday. Domestic shipping charges are included with the winning prize, but international winners will be required to pay for shipping. Posted: Sat 21 Feb, 2004 7:00 pm Post subject: i remember that book. . .
wow. . . i remember checking this book out of the library more times than anyone. come to think of it, i think i was the only one who ever checked out the book. anyway, a great book. if i could only remember what library had the copy. . . I was lucky enough to have purchased a new copy of that book from Walden Books back around 1988. It's the best book of it's kind in terms of big, plentiful, high quality photos of European Armour. This is a real catch! This is a great book. I got a copy of the book about two years ago in a used book store for around $10. I love the book and had no idea the book was out of print. Should be in everyone's library. DITTO! I have enjoyed my copy of this book! I have a very battered ,and now incomplete,copy of this book on my workshop bookshelf,and David has been trying to get me another copy as well for the library ! 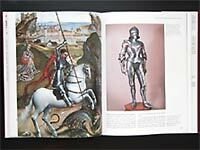 But they are now very difficult to find which is a shame as they really are a must have book if you are at all interested in medieval armour. This book is regularly on E-Bay. I have purchased no less than 6 copies over the last year as gifts to students/friends. Haven't paid more than $20.00 for a copy, including shipping and handling. It may not be readily available in most bookstores... but it is available on internet book sites and E-Bay rather frequently. A quick search of E-bay did not find anything at this moment... however keep looking, they are bound to pop up. It is an excellent book and I highly recommend it, especially for beginning libraries. I just secured two more copies of this book and will be giving them away in future contests! If you've joined this contest, it makes you automatically eligible for these future contests as well. Your odds of winning this book just tripled. Only one more week of this contest! All entrants are automatically entered in the next one. Wow. We're already down to the end of this contest. The final day of entry is today, March 14th. The winner will be announced Monday, March 15th. As mentioned, all who have entered will be automatically entered into the next one, to be announced very soon. Good luck to all and thanks for playing. Entry for this contest has been completed! No new entries are allowed. Click here to see who the winners are!